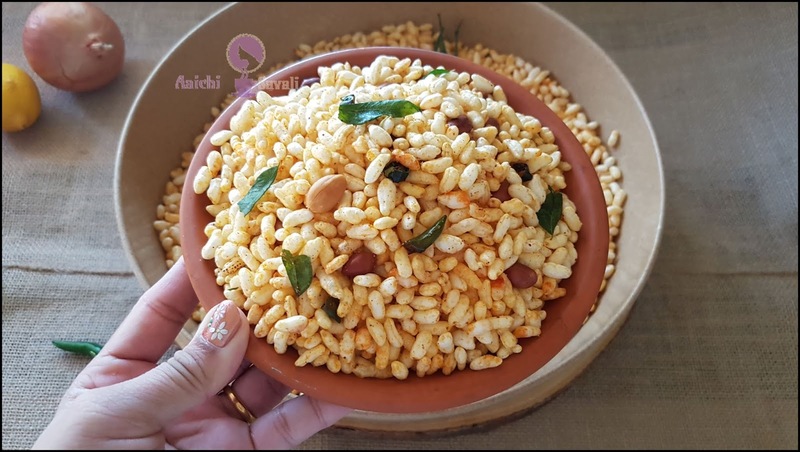 this crispy, light and fiery spicy Bhadang (puffed rice/ murmura) for a snack to give your midday or evening snack a healthy and tasty change. 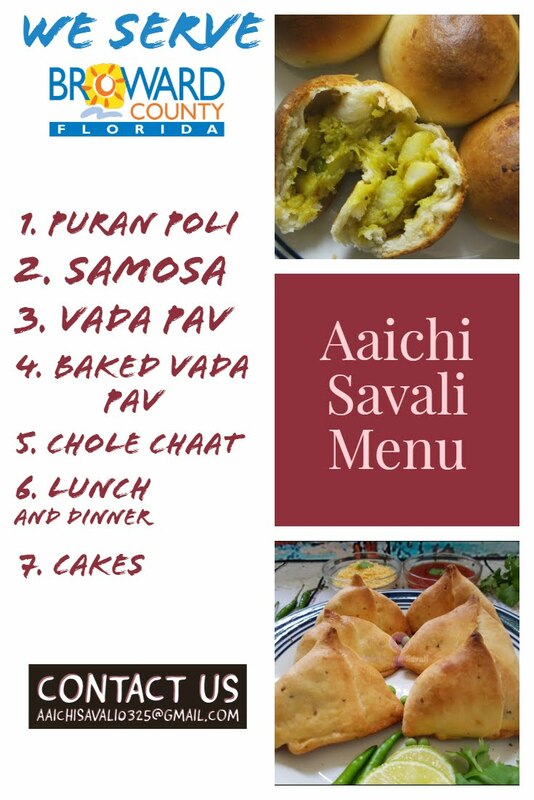 It's healthy and is low in calories and low in fat, and also its better to snack on than chips, fries or any fried food items. I have prepared it using just 2 Tsp oil. These simple, crispy and refreshing bites are great for digestion and are packed with nutrients like folate, Vit.A, E. The low-calorie snack is packed with carbs to keep you energized, fiber to keep you full and full of nutrients. Peanuts are low on saturated fats, cholesterol, and sodium and are a good source of Vit. B group, Vit. C, E, Magnesium, and phosphorus. 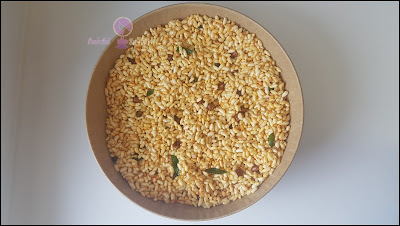 Bhadang is a kolhapuri style to spice up puffed rice. 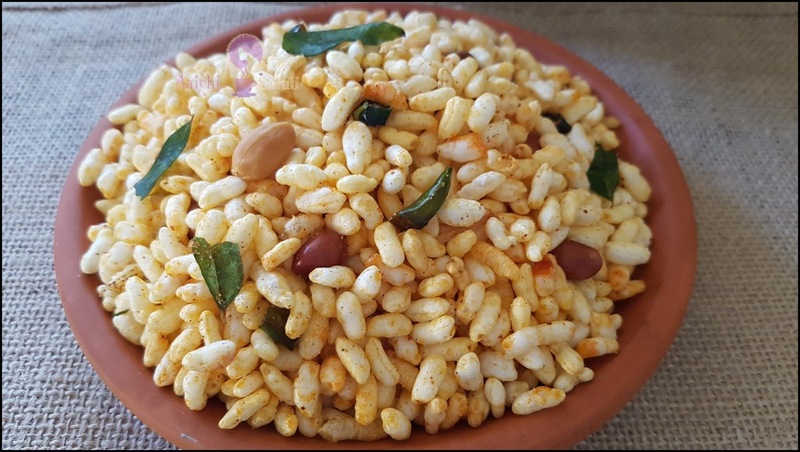 In Indian cuisines, you can find many ways to cook and eat puffed rice. 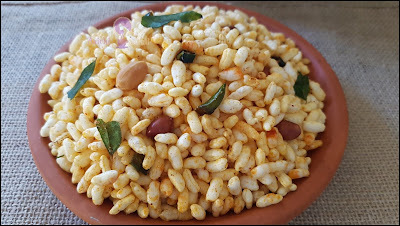 Sometimes it prepared as spicy and sometimes as a sweet snack. Here I have prepared bhadang in 15 minutes, by frying garlic, peanuts in a pan using 2 Tsp veg.oil and tempered with curry leaves, green, and red chili powder. This is a very easy and quick method, you can be snacking on this in no time. Bhadang is a powerful combination of pungent garlic, nutty and creamy peanuts, crispy puffed rice perked up with red chili powder is a flavourful snack or chaat that competes healthily with the other snacks recipes. It is vegan, gluten-free, quick and easy to prepare the snack. Store this bhadang in an airtight container, and this will stay fresh, crispy and crunchy for 3-4 weeks. Each Serving of Bhadang Contains 100 Calories. Heat pan on medium to low flame and add puffed rice/murmura and saute and cook for 3-4 minutes, until it becomes crunchy. become crispy, crunchy and golden brown in color. Now, splutter cumin and mustard seeds, curry leaves, green chilies. Add red chili powder, turmeric, asafoetida, and salt and mix well. 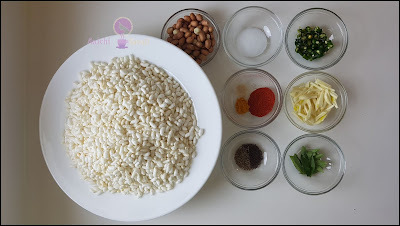 Now add puffed rice, fried peanuts, garlic and mix all well. Tadaa, crispy and crunchy bhadang is ready to serve. Enjoy!!! Per serving contains 100 calories, along with 13.87 g carbohydrates, 3.2 g fats, and 2.1 g protein. It can provide essential nutrients like B vitamins, iron, magnesium, potassium, and phosphorus. Puffed rice is light and easily digestible. 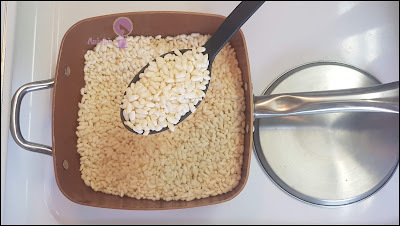 Though it has more volume than regular rice, it contains less calories and almost no fat. So, it can be used as a snack between meals. 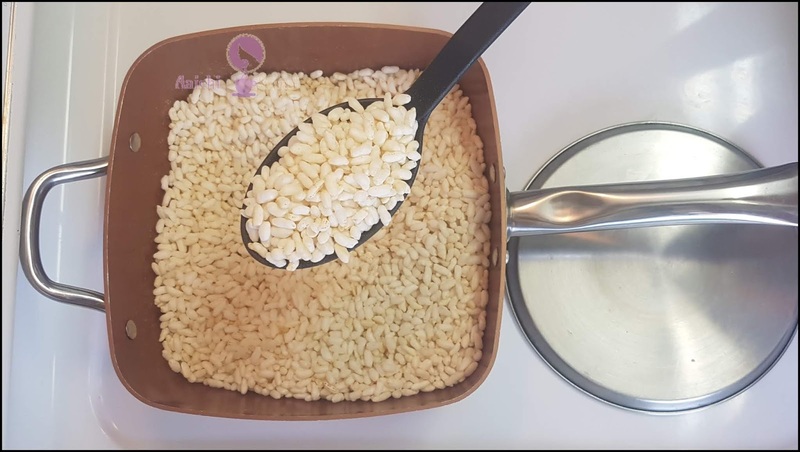 Puffed Rice is good for weight loss, as it digests quickly. It is good to it for snack, breakfast or as a midday snack.